HILLARY CLINTON: I was shocked and appalled because I’ve known him through politics, as many Democrats have, he’s been a supporter. ANDREW MARR, BBC: A funder. CLINTON: He’s been a funder. For all of us. You know, for Obama, for me, for people who have run for, you know, office in the United States. So, it was just disgusting and the stories that have come out are just heartbreaking. And I really commend the women who have been willing to step forward now and tell their stories. But I think it’s important that we not just focus on him and whatever consequences flow from these stories about his behavior but that we recognize that this kind of behavior cannot be tolerated anywhere, whether it’s in entertainment, politics. After all, we have someone admitting to be a sexual assaulter in the Oval Office. There has to be a recognition that we must stand against this kind of action that is so sexist and misogynistic. MARR: And this depends on women coming forward and the courage to come forward. And yet in your book the three women, brought onto the stage by Trump, attacking your husband and you kind of dismissed them. Was that the right thing to do, are you sure about that? CLINTON: Well, yes, because that had all been litigated. That was the subject of a huge investigation as you might recall in the late ’90s and there were conclusions drawn and that was clearly in the past. But it is something that has to be taken seriously — as I say for everyone, not just for those in entertainment right now. Sorry Hillary. 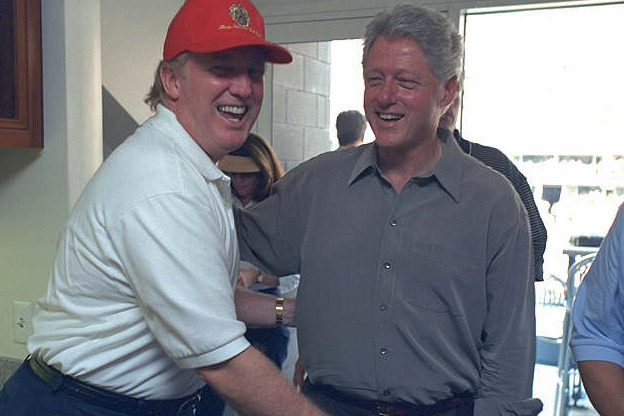 If it is valid to bring Donald Trump into the discussion of sexual harassment after Harvey Weinstein’s fall (as you did) then it is also valid to bring Bill Clinton into the discussion (which you falsely claim is not valid as it happened in the past). Of course the Clinton double standard extends far beyond Bill’s behavior. Hillary Clinton described the email practices under Bush as shredding the Constitution, and then she went further in violating the law. Many Democrats will criticize every unethical action under Republican administrations while ignoring how Clinton ignored the ethics agreements she entered into before being confirmed as Secretary of State. Many Democrats who attacked the Iraq war ignore Clinton’s history of lying to promote foreign interventionism. Many Democrats who protested violations of civil liberties under Bush totally ignore Hillary Clinton’s far right wing record on First Amendment issues. Many Democrats who opposed the infringements on separation of church and state by Republicans have ignored Clinton’s support for an increased role for religion in public policy.